It always seams you take some time in coming out with new cursors, but you can tell by the work , it was worth the wait. You put a lot of time into these. They go perfect with SharkBlues Windowblinds. Outstanding SIR. Just when you thought it was safe to go back into the water. This cursor is TOO much, RadFX. Thanks! These are just beyond words... specially for me! Just amazing RadialFX.The Working in background is fantastic. Hey, the whole darn thing is GREAT! Time to watch Jawz again! Incredible! 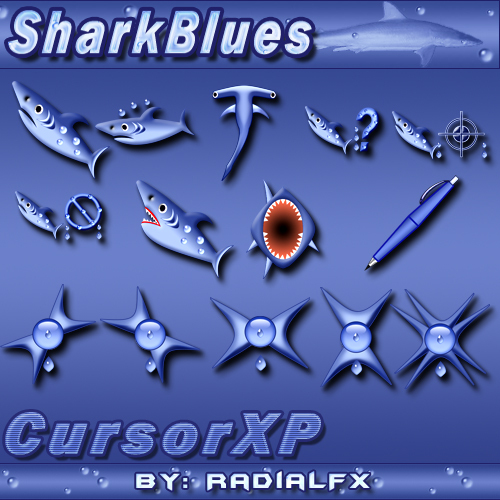 Thanks RadialFX for a 'KILLER' cursor! Thank all of you for your very kind comments. Your support is appreciated more than you'll ever know. Thank you. Amazing work, Radial. Thank you for sharing it with us. The Old Crab recognizes some of his friends here. Radial this is one of the best cursor sets I've seen to date! These are great!